Meat sweats. Perhaps that’s the technical term for what we’ve been experiencing after four days of Hill Country Brisket Pursuit. Can’t look a cow in the eye anymore, and I’m craving salad, or things that crunch. The BBQ Bus can pass right on by – I’m done! We tried to make the most of our time in Austin, but honestly, Day 3 was a bust. We were just bagged out, and wanted nothing more than to lay around with books. Strolled around the three-mile campground loop with Jezzy, and waited for the BBQ hour to strike. About 2pm, John announced that Vic’s BBQ would be out strike for the day. We roused ourselves from a meat-induced stupor, dragged our bikes out from under the tarp which kept the intermittent rain from making the saddles wet and nasty, and headed off for a late lunch. John enjoyed ribs/brisket, and I sampled sausage/chicken. It was good, and the coleslaw was magnificent. Vic’s is not a fancy location by any means – right on the corner where we pushed the pickup truck the previous day. But, Vic really knows how to smoke meat. In spite of our good intentions to just QUIT, we did get a few bones to take back for snacks later. We may both need Twelve Step Programs when we get home. Day 4 was our day of reckoning. 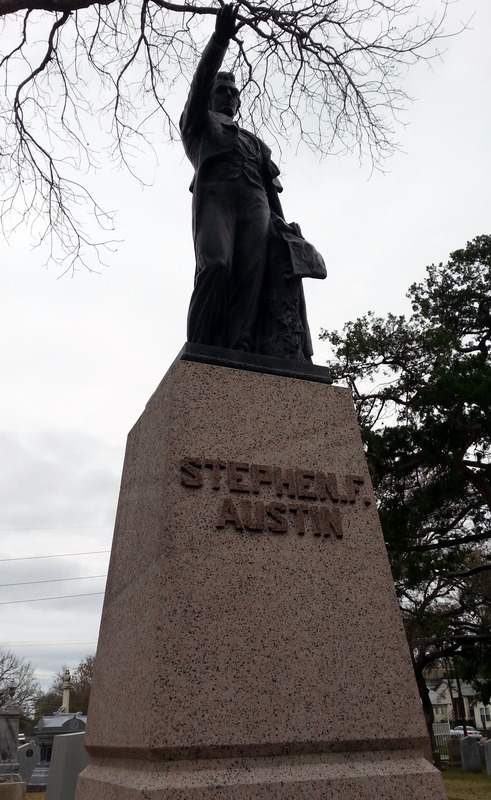 This was to be our last day in Austin, and we still hadn’t really seen much of the town yet. 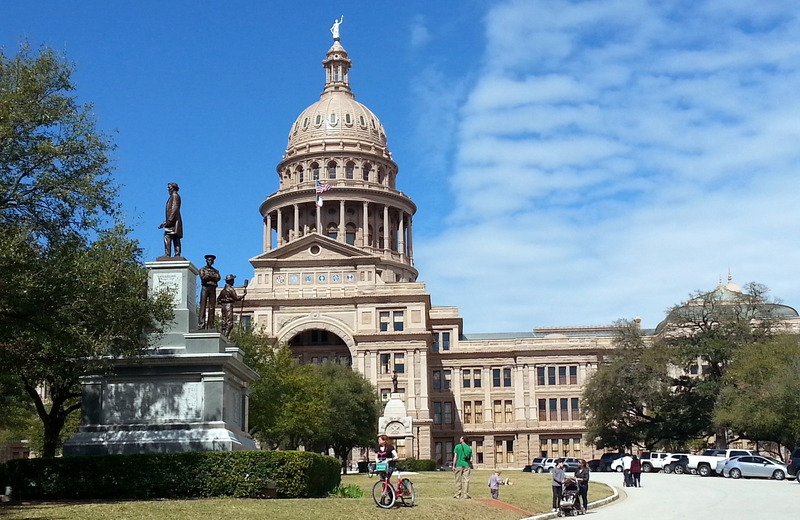 Our agenda included the LBJ Presidential Library/Museum, the State Capitol building, and some kind of beer/BBQ joint for lunch. Compared to our previous days, it was an ambitious agenda. 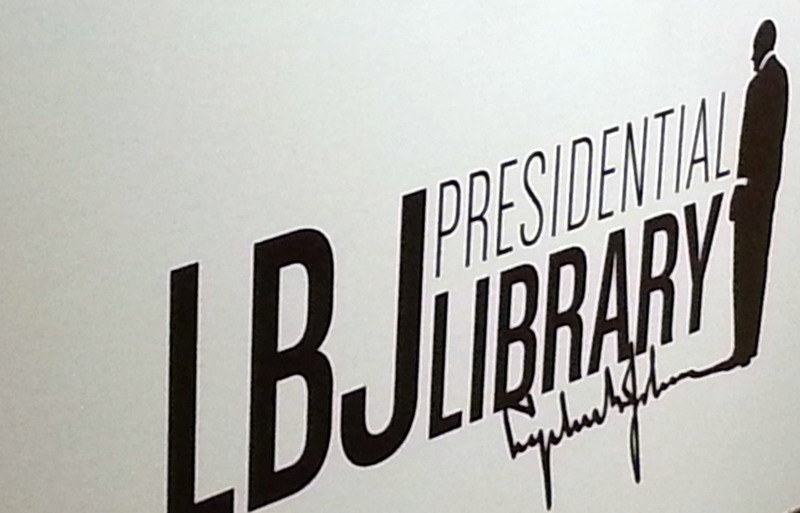 The LBJ Library, on the campus of the University of TX was an interesting way to spend a morning. Until this past week, I probably haven’t given LBJ ten minutes of thought in the past 40 years. Although I know he ‘inherited’ Vietnam, in my mind, it was HIS war. 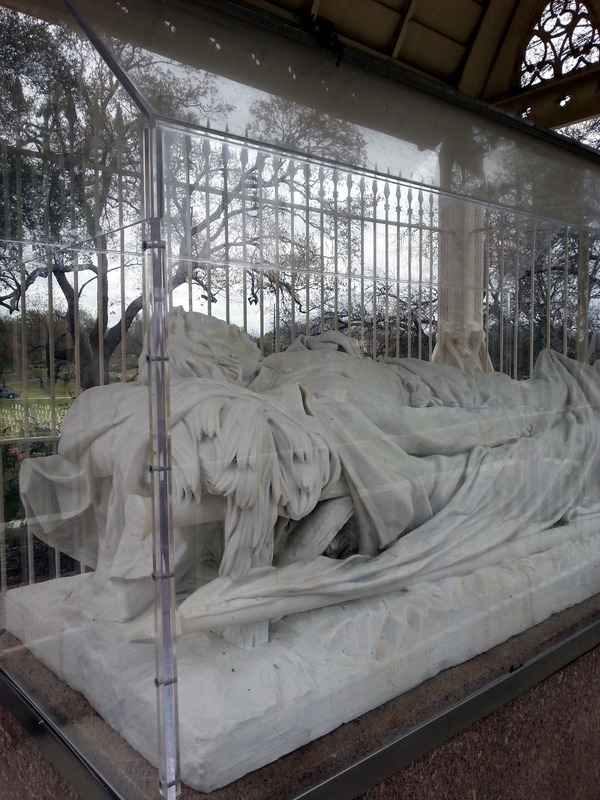 So, it was so unexpected for me to see this sympathetic view of him – hearing him say, “I can’t get out (of Vietnam), and I can’t win it with what I’ve got.” It’s been on my mind since we were there. Hard to believe that his domestic legacy has to be trashed by a lousy, ill-advised war. (just my opinion – we can argue all day about that). Protests during his Administration were legendary. What was interesting to learn that LBJ was a freshman congressman in the 1930s, and was an ardent FDR supporter. His Great Society plan was intended to pick up and finish what the New Deal left undone. 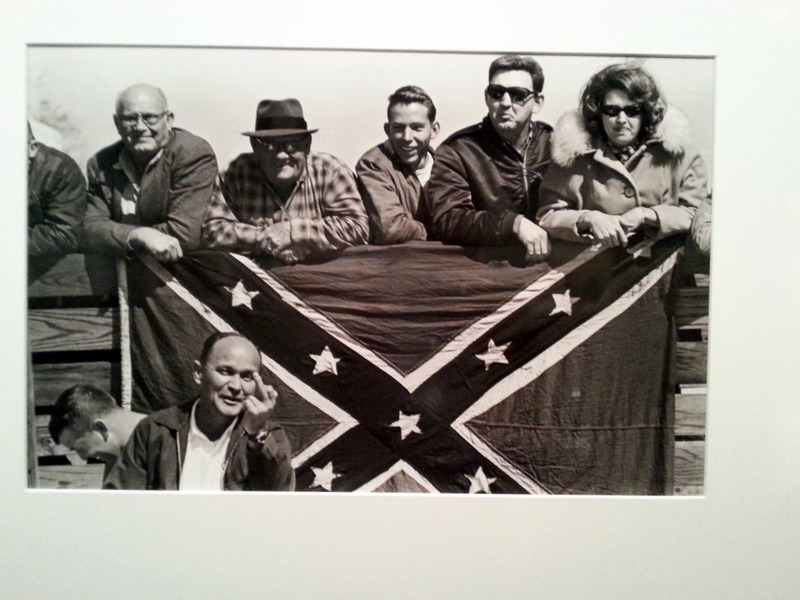 He signed the Civil Rights Acts of 1964 and 1968. Check out this photo from a protest about that. Thurgood Marshall was appointed the first African American Justice of the Supreme Court by LBJ. He created Head Start, Medicare, and Medicaid, and signed the Immigration Act of 1965, which liberalized immigration policy for non-Europeans. He signed more bills into law than any other President (other than FDR), in spite of being in office only five years. It would be easy to spend hours at the Library – I can’t wait to visit other Presidential Libraries – this was my first one. We left the Library with more information about LBJ as an individual than we had ever considered. Isn’t that the point of a visit like this? 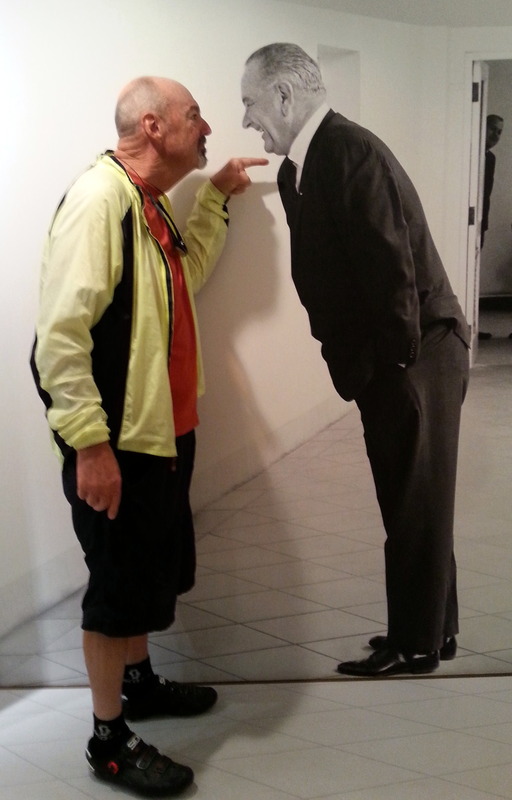 He apparently didn’t hesitate to go nose to nose with anyone to reinforce an opinion, or solicit a vote. But, John decided to give ol’ LBJ a Crankshaw Cranium Crushing. 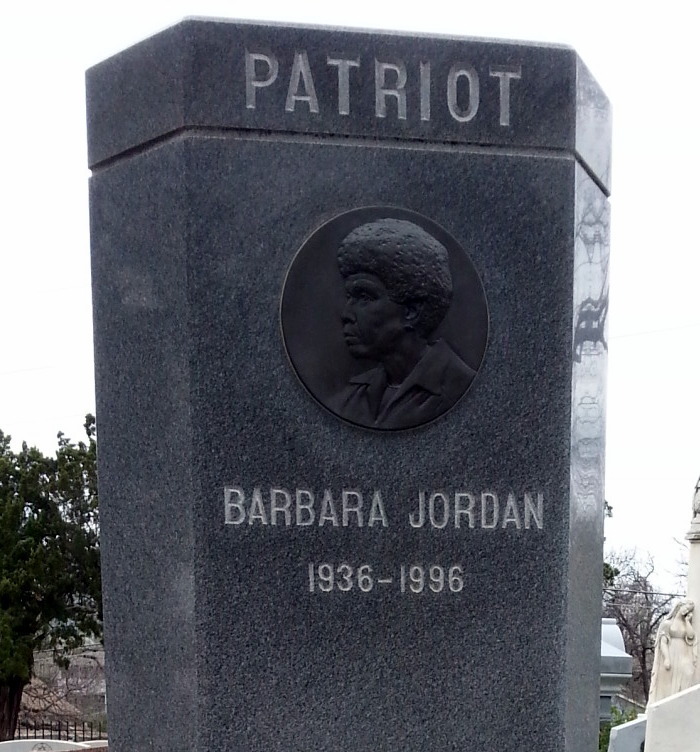 While cycling up a big hill to UT, we passed a cemetery which had several large and distinctive grave markers visible from the street. We stopped to investigate. 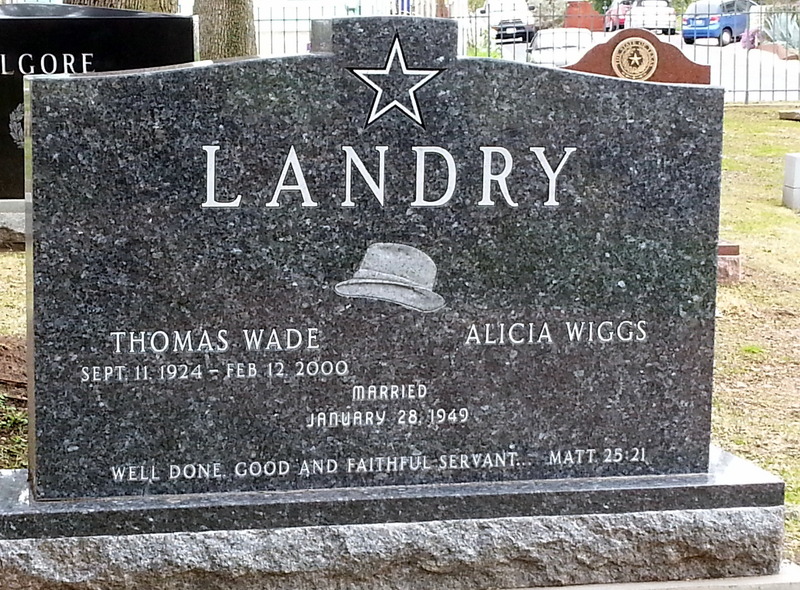 This was the Texas State Cemetery, where all the Who’s Who of Texas seem to be buried. There are dozens of familiar names. 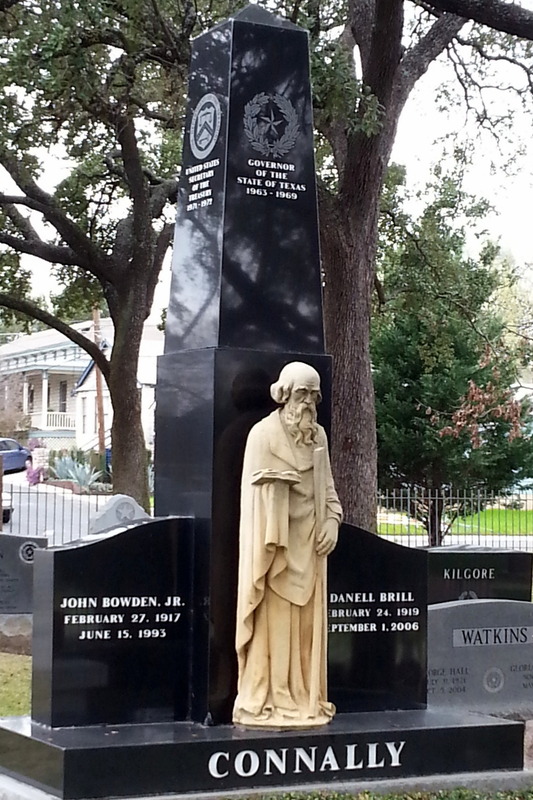 The most interesting marker, though is that of General Albert Sidney Johnston,of the Confederate Army, killed at Shiloh in April 1962. It’s a beautiful and peaceful spot in central Austin. 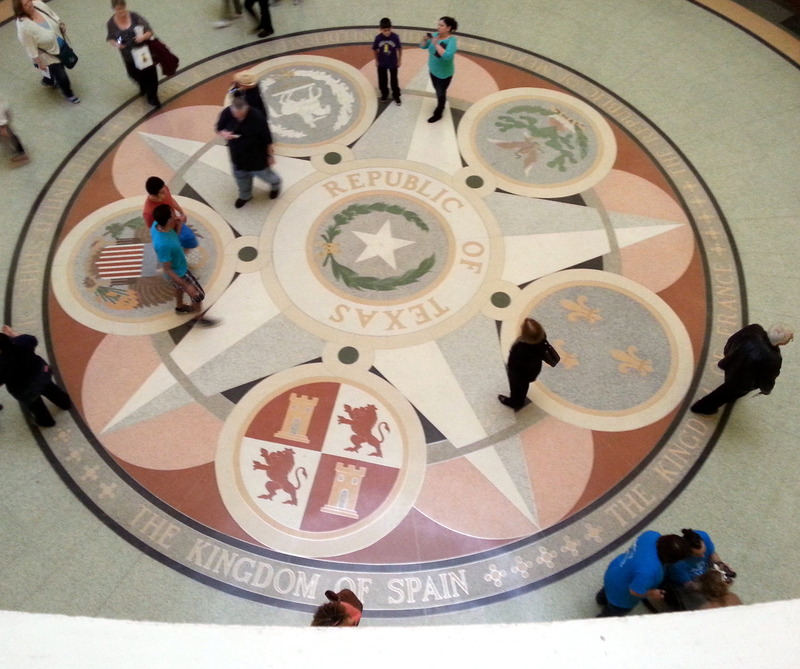 Next on our agenda was the State Capitol building. From our vantage point on the hill at the cemetery, we could see the oddly colored dome. The trick was to find a bicycle-friendly route to get there in midday traffic. Yowza! But, since I’m here to relate the story, you can surmise a happy ending to our ride. It’s impressive. 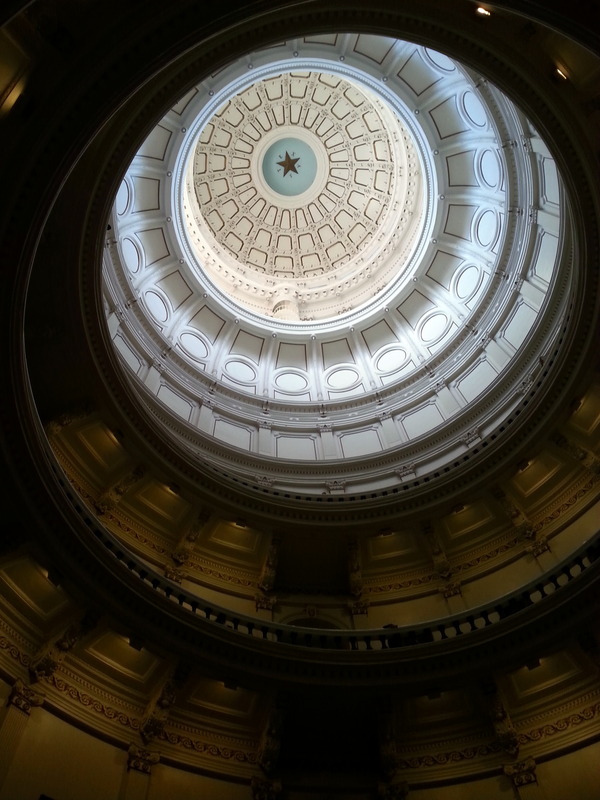 This shot looks up into the dome. But, the outside is painted a very unappealing color. We dubbed it Benjamin Moore Oil Sludge Tan. It’s awful. 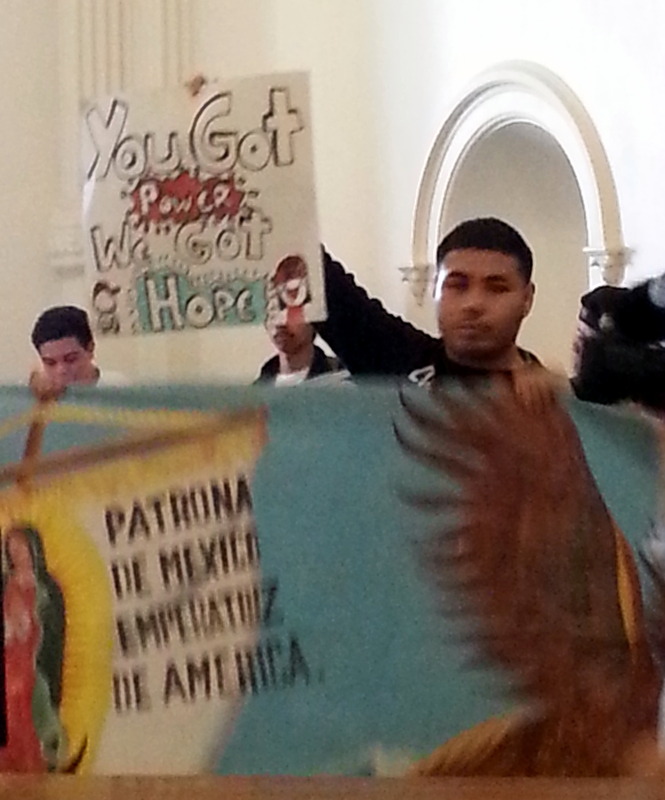 On our way out, a large group had gathered just inside the entrance to protest the Governor’s stance on deporting parents of Dreamers (Dreamers are children, born in the US, to parents who who do not have legal immigration status) The protest, although orderly, was loud. 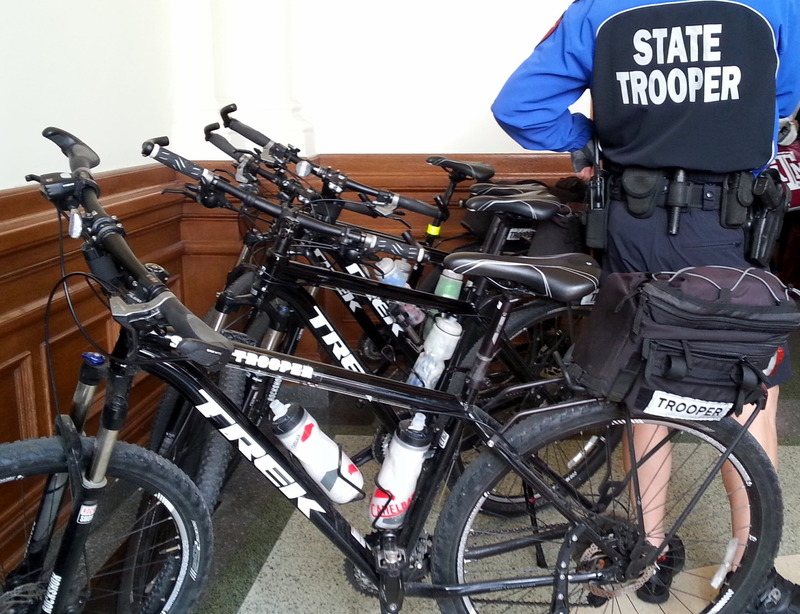 It attracted little attention though, leading us to believe that this may be a fairly usual occurance in Austin. Cops entered, we exited. 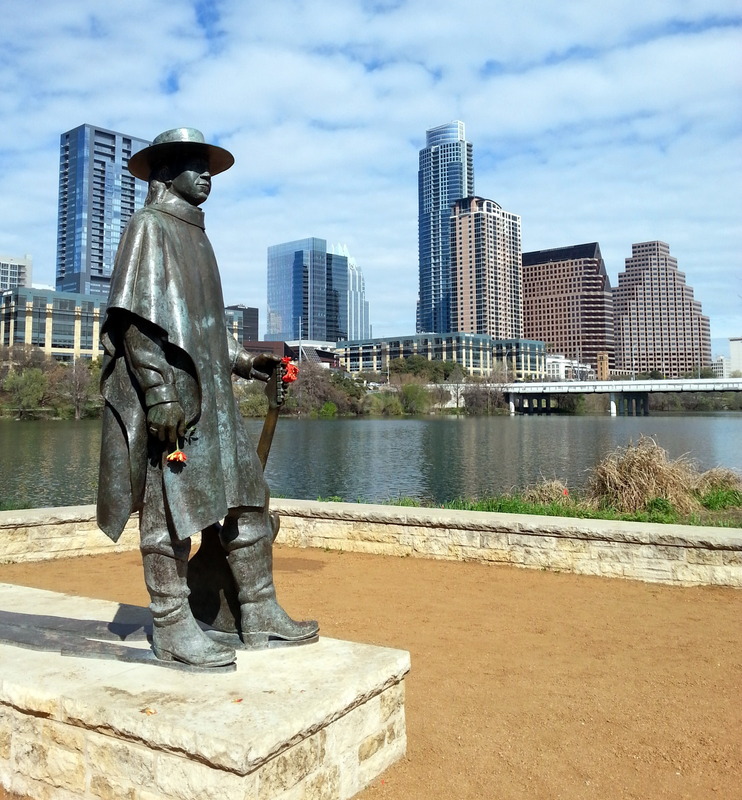 We made a quick stop at the Stevie Ray Vaughan statue. Loved his music, always. Black’s BBQ was our lunch stop. Good, not the best (sausage ROCKED, though). Long ride back to camp to cap a terrific four days. 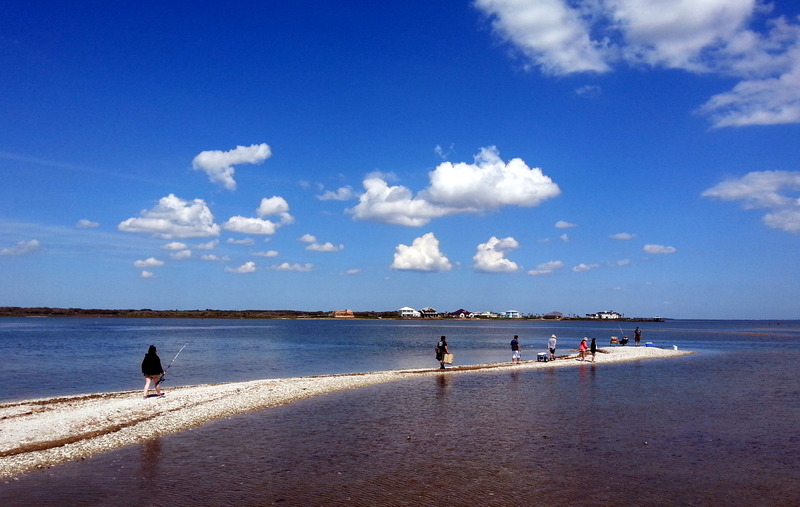 On to Goose Island State Park, along the east coast of Texas. We’re headed there on the recommendation of blogs we’ve read, and also on the advice of Glen and Caite, with whom we shared a beer and a campfire while in Austin. With all the Spring Break camping traffic, we felt lucky to snag a site for three nights. 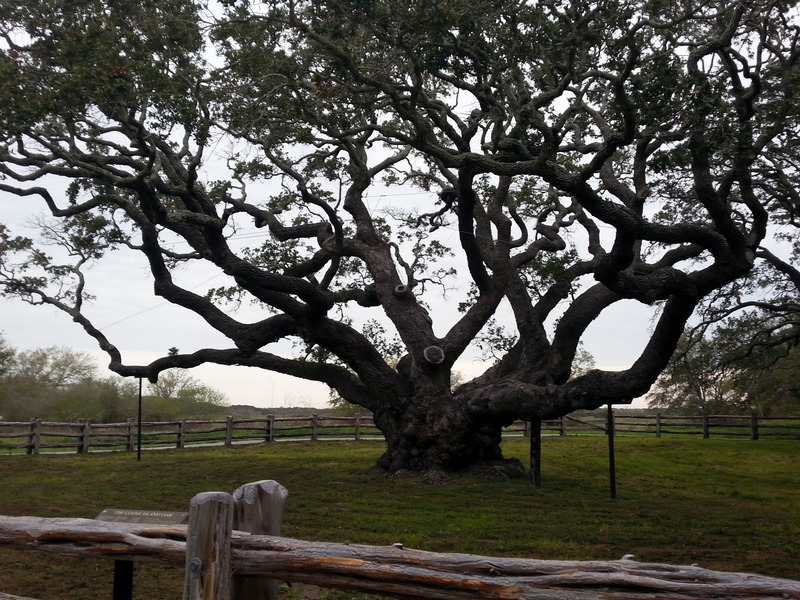 Not only is Goose Island home to the Texas Big Tree, a Live Oak estimated to be nearly 1100 years old. It’s over 35′ in circumference, and is impressive in a sprawly, majestic manner. I wished for something to be at the base to help with the scale of this massive tree. The photos really don’t do it justice. The Live Oaks in this area are a real curiosity. 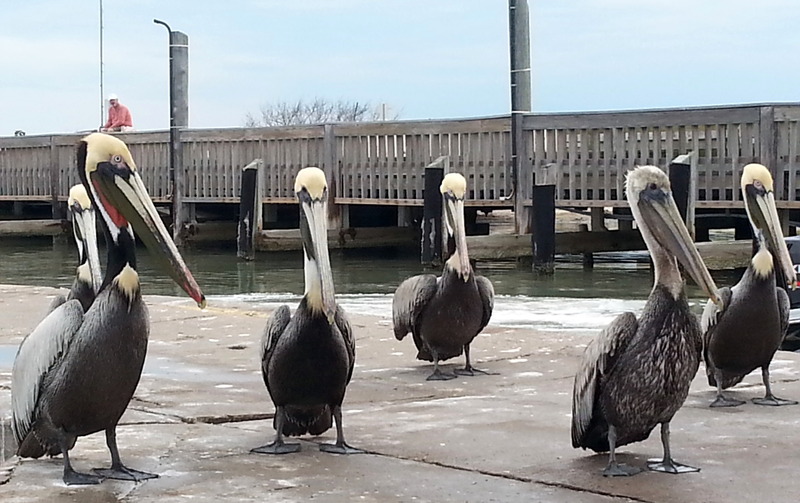 Along the Gulf Shore, there’s a spot where they are all severely bent over – away from the Gulf. There’s speculation that it’s due to gravity or wind, but the cause is unknown. It’s gorgeous, though. One of the real draws of this area though is that it’s near the Aransas Wildlife Refuge, where the 500 Whooping Cranes in existence winter. We were fortunate to see maybe a dozen of them, in flight and on the ground. They are the tallest birds in North America, and are a stunning white with black wingtips. In flight, they are unmistakable. Near the State Park, there’s a farm with a large field where several of the Whoopers congregate every day. We cycled over at various times to see them. With such a small number in existence (although this is a HUGE increase in the past years), we were thrilled to hear and see perhaps 20 different birds, on the ground, and in the air. One of the other highly visible residents of this area is the Turkey Vulture. They are everywhere! Circling, and reminding me not to move too slowly. There are also Ospreys, elegant and fierce hunters. We were treated to a shouting contest between Great Horned Owls one night. After about a half-hour, they both left. 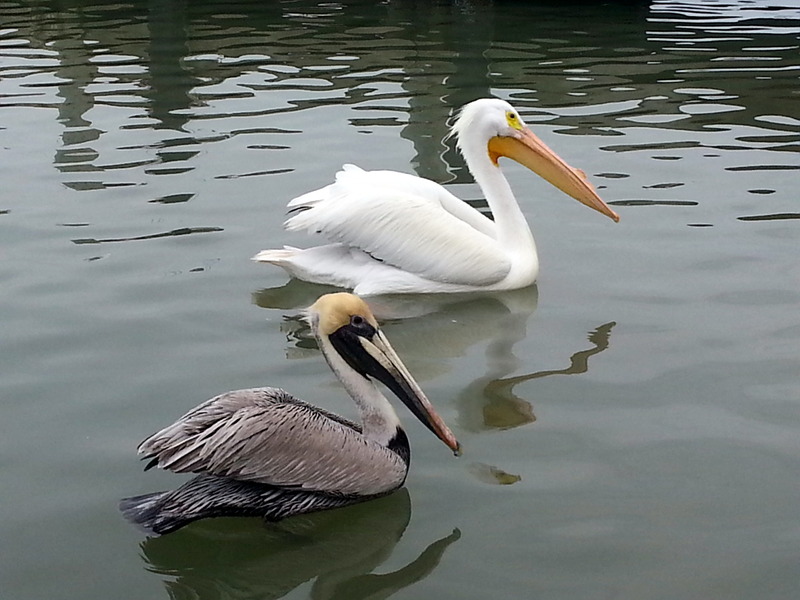 On the waterfront, the pelicans rule. In Texas State Parks with a river or water source, you can fish without getting a fishing license. This is a huge attraction, and makes for many restful opportunities. Needless to say, we loved our stay at Goose Island. We made a new T@B friend, Liz from Wyoming. She’s a free spirited artist, and we loved sharing dinner and stories over a campfire with her one evening. Just a few little Texas-y things though……. We made a trip into Rockport, TX from Goose Island. This involves travleling over a long bridge which spans the Causeway. The road is two-way traffic, with hardly any room on each side between the roadway and the guardrail. We crossed behind a Sheriff’s car. The suddenly braked, and the Deputy on the passenger side got out of the car and picked up a big piece of metal trash which was in the narrow space between road/rail. We figured he would put it in the trunk of the cruise. Hope! He chucked it over the rail into the water! Did he look to see if there was a boater or fisherman nearby? Nope! Could have been ugly! I’ve got poison ivy, plus 300 mosquito bites (give or take a few). Don’t know about this Texas drought thing. We’re encountering rain wherever we go. 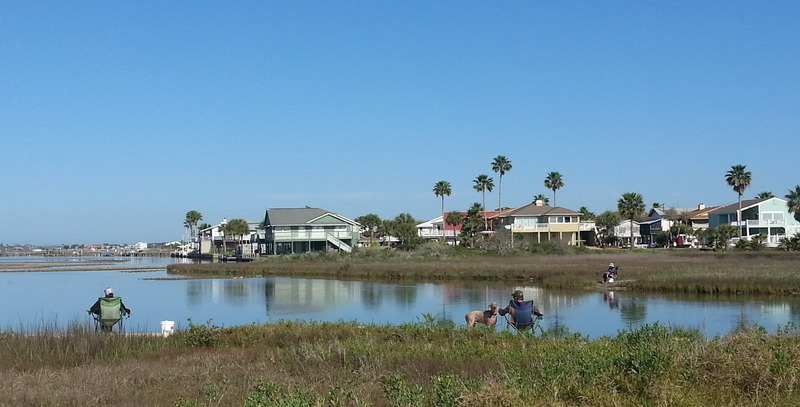 For example, how do you like this picnic area at Galveston Island SP, where we’re currently staying? Hope your snow is melting wherever you are. We are pushing toward home, but not too quickly! This entry was posted in camping, cycling, great outdoors, library, retirement, simple camping, solar camping, state parks, T@DA, Texas and tagged Austin, barbecue, birds, brisket, camping, Goose Island State Park, historic sites, LBJ, Presidential Museum, T@DA, Texas, Whooping Crane by Judy Crankshaw. Bookmark the permalink. We were at Goose Island State Park around the same time as you! 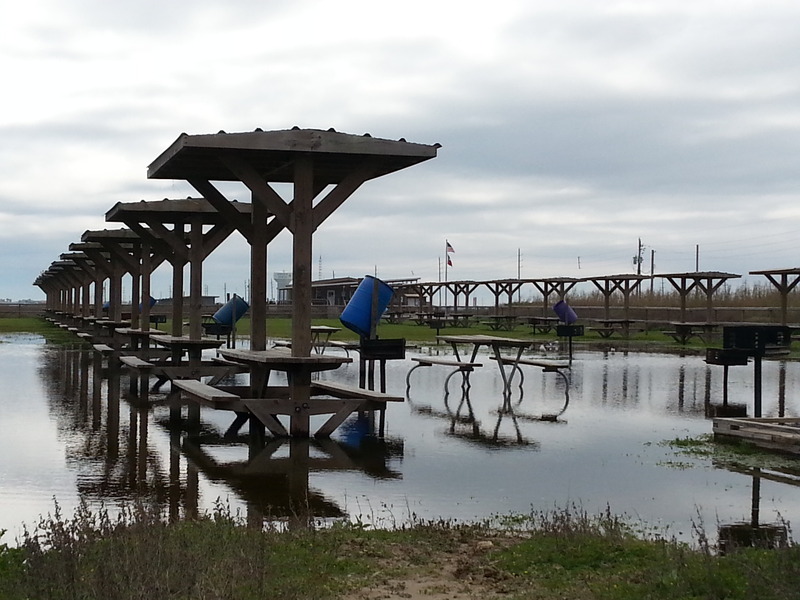 And we also experienced the flooded campground at Galveston Island State Park. Love the video of the Whoopers! Thanks! The Whoopers were the highlight of our trip. We would definitely go back to that area and enjoy all the birds – its amazing to see them all at once like that. Wonderful to see so many birds. The Whooping Cranes are beautiful! The cranes are spectacular. Hope you get the chance to see them sometime. Don’t know if California is ever in their path. Lots of great information! Now I am understanding why my friends enjoy visiting Presidential museums. Also good to know about the fishing in in Texas state parks. We will be bringing our fishing gear next time we head west. Hope the rain lets up and your house is safe from the northern winter! Thanks, Lynne. John always threatens to drop a line and bring dinner home, but has yet to do so. Part of the Fisherman’s Creed, methinks. We know the snow is gone, and the house is still start ding. For now, that’s enough information. It is really wet here. Our screens are thick with blood sucking mosquitos. 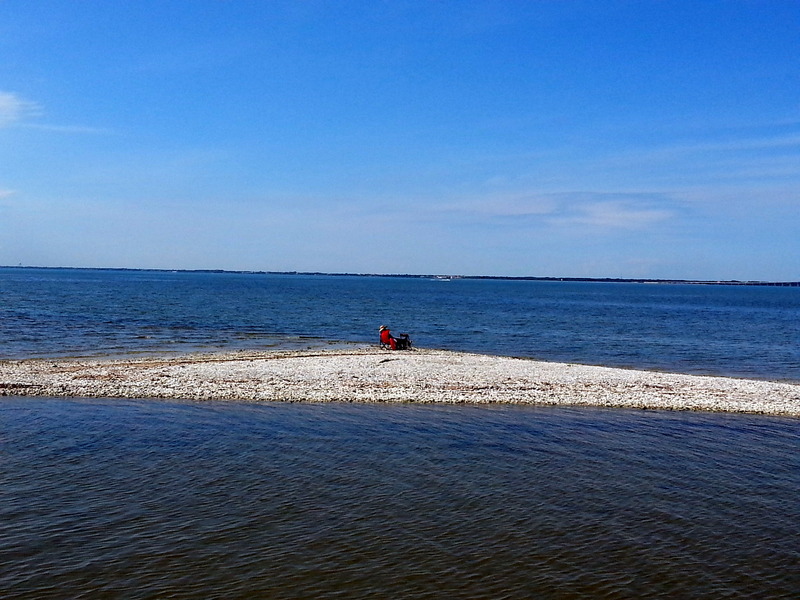 Sure wish we were camped on the beach, instead of in all the grass here on the Bayside loop. That would probably be slightly better. Caught a flash of ‘your’ Roseate Spoonbill yesterday, but didn’t get a good look at her. Bummer! Hey Judy & John, Those coastal mossies just get more nasty as the weather warms. Weren’t they the most voracious! I made it to Denver today (Thurs). Long rainy (pouring with lots of semi’s on the 2 lane 287–YUCK) day’s drive from THE LOVELY Palo Duro Canyon (thanks for the tip!). They said they were full but I hung out til 6 and got a spot. It hadn’t started raining til Oklahoma. Spent Tuesday in Austin with son at SXSW lunch, then a very quiet camp that night at Lake Brownwood SP which should be called Lake Brown. Muddy water… only 3 other campers. Peaceful tho. Will rest up and yet another repair on the housing for the gas & battery. Hey Liz! Good to hear from you. Your ears must have been burning, as your name comes up in daily conversation, it seems. Hope your road smooths out as you get the hang of towing and camping in your T@B. New fridge working? Go back to Palo Duro when you can spend some time there. It’s a great camping spot. Meeting you was one of the high points of Texas. Can’t find your FB page, but I’ll keep trying. Take care of yourself. Enough with the repair crap! Hope this is the end of it for you. Could I have your permission to use your LBH quote picture for my Facebook cover photo? It is a great quote and the photo would fit perfectly. I’d be happy to link to your blog with a photo credit for it. Thank you. Of course. Its in very large letters on the Library. Great blog, as always! Bob read it first this morning and commented about how much he enjoyed it! Where exactly on this leg of your trip were you attacked by mosquitoes??? I want to avoid that place! LOL Goose Island sounds wonderful, though I fear that may be where the mosquitoes were. It sounds like the entire state of Texas has been rainy. Our friends Terry and Gid have had rain since they arrived a couple of weeks ago. 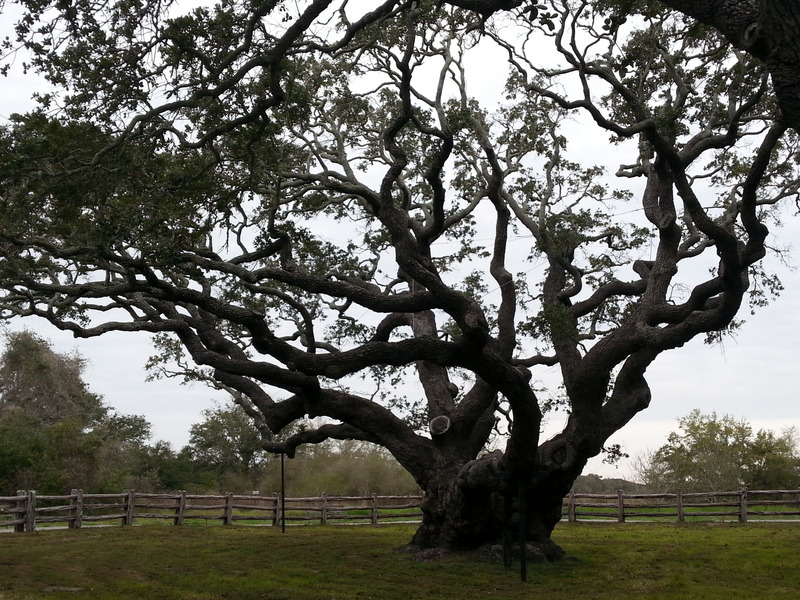 Loved the photos of the amazing live oaks. 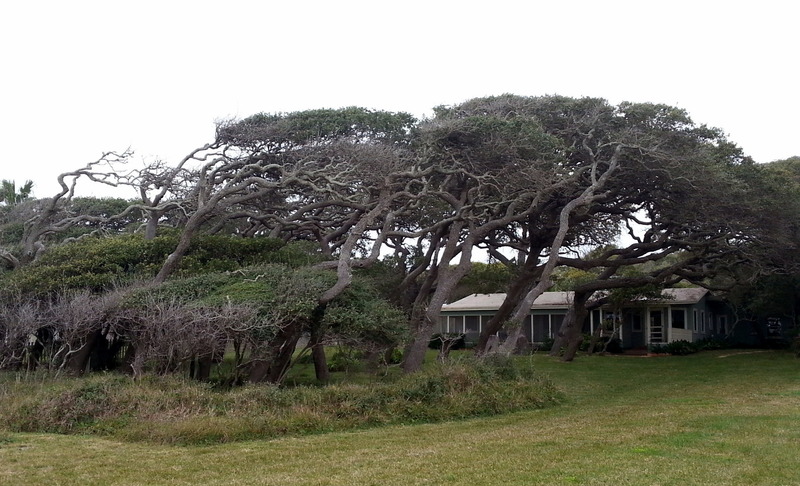 How cool would it be to have a tree like that in your yard? Also loved the photo of John and LBJ!! Keep having fun, you two!! I think all the rain has finally caused the mosquito population to explode. Then, first thing….they come looking for me. 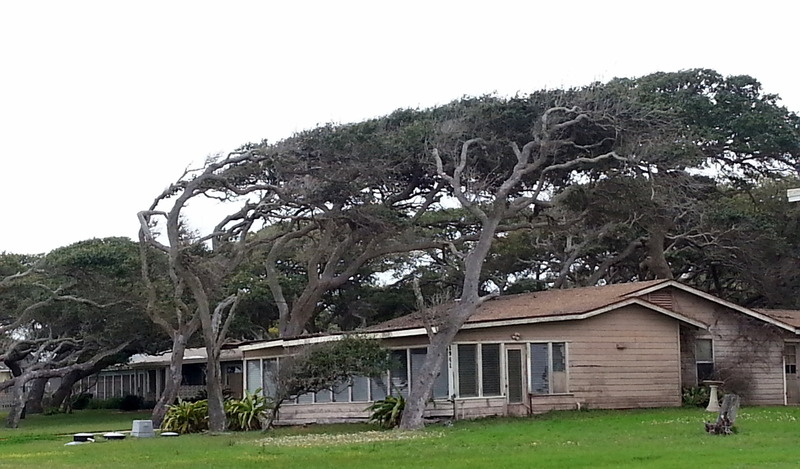 Love the live oaks, but I would be quite concerned if they were leaning over my house like they are in the photo. Seems like they eventually have to fall over. I learned that they always have leaves because leaves only fall off when they are pushed off by a new shoot beneath it. Were hoping to get out of the wet weather soon. Will take forever to dry things out. Again you are teaching me new things that fascinate me. I love traveling through your eyes. Hope your poison ivy and mosquito bites are gone soon. That’s a real bummer for traveling. Have fun on the rest of your stops. Thanks, Alison. You’re probably already in dreamland as I write this. Hang in there, and I’ll see you in a couple of weeks. I loved the picture of John giving LBJ what for. Loved the cranes. Not the turkey buzzards too much. The trees were fascinating. Thanks, Sharon. There are just so many little tidbits – I put most of them into the blog just so I’ll have a way to remember them for myself. The blog is mainly a vehicle for John and I to remember where we’ve been, and what we’ve seen. We sure can’t rely on our brains for that anymore. The bonus is having readers, like you, whom I’ve never met, but feel like I know. Sharon, will have to admit that I had to look those up! Didn’t know they existed. Thanks for the Poetry 101 lesson. Wow! You two really packed a lot into a short time there! Of course I loved the whoopers and other birds, but I liked the bits of history as well. Poison ivy and mosquito bites sound like a bad combination to me, I hope you’re fully recovered by now. The mosquitos here are vicious. I feel like bait! We are in for a week of rain here. So foggy here this morning in Galveston that we can’t see out the windows. Hang on to your sunshine – you deserve it after that long, cold winter.